When the invention of the microprocessor paved the way for personal computers in the early 1970s, most consumers considered them to be nothing more than oversized, overpriced calculators. But it didn't take long for people to realize these "oversized calculators" did a whole lot more than totaling numbers. Without even having to leave the house, people were suddenly able to shop and compare items at different retail outlets, look for jobs, send mail, purchase music, pay bills, reserve library books, rent movies and more. In fact, it seemed the only thing personal computers couldn't do was generate cash. Until now, that is. In a glowing example of 21st Century convenience at its highest level, millions of U.S. consumers are tapping into the latest lending trend by obtaining electronic payday loans when they need money in a hurry. Joining them, and having extra funds at your disposal as quickly as within 24 hours, is as easy as filling out our online application. Once we receive it, one of our qualified lending professionals will immediately get to work on processing your request and electronically transferring the money directly into your bank account, where it will be instantly available to withdraw or spend using your debit card. When your next payday rolls around, the money you owe will be automatically deducted from you account, making the entire process on your end completely hassle-free. And you don't even have to leave the chair you're sitting in now to make it happen. 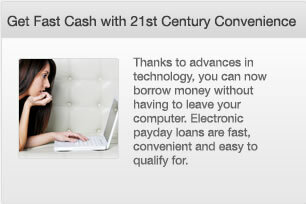 The fast turnaround only scratches the surface of the benefits offered by electronic payday loans. Unlike conventional loans, which require credit checks, payment history reviews, employment verifications, collateral appraisals and other lengthy procedures, the only prerequisites needed for an online advance are that you have a job and a bank account with direct deposit. You don't even have to wait for your credit report to be reviewed. Because the money you borrow will be automatically deducted from your account on your next payday, whether you have a good credit history is irrelevant. Plus, there's no long-term payment plan to squeeze into your monthly budget; there is no danger of skipping a payment and critically damaging your credit score; there are no revolving interest charges to keep you paying on the balance for years to come; and there are no collateral requirements that put your property, home, or vehicle at risk. Like millions of borrowers before you, fast, hassle-free cash is at your disposal when you need it--thanks to the power of your PC.